Usually people have lots of questions. It’s only natural as you may not have seen a dog fence in action – people ask “what is it?” or will the dog fence hurt my dog, how will I take him out for a walk. Hopefully we have covered the most common questions below but if we’ve missed something do let us know! What is a pet containment fence? The Pet containment fence is a dog fence or cat fence system that uses an electronic radio signal to keep your pet WITHIN a designated containment area. This could be a small town garden or a sprawling country estate. A containment fence can also be to keep pets OUT of an area, such as a swimming pool, patio, or veg patch. The system sends a coded signal through a boundary wire that surrounds the designated area. The pet wears a computer collar which is programmed to pick up the signal. If the pet enters the area the collar alerts the pet with a warning beep and if the pet continues the collar emits a static impulse. The impulse is low level and safe and is not an electric shock. The signal around the wire is 360 degrees and so the pet cannot jump over, run through or dig under making a containment fence a more secure option in most instances. The DogFence pet containment fences also work in the interior of your home to keep your pet off a sofa or away from a kitchen worktop or out of rooms. These containment fences can be installed on most terrains and can even be run through shallow water and wooded areas. Containment Fences are a cheaper option to traditional stock, deer or panel fencing. These fences also cover driveways and areas that can’t be fenced and they work silently and invisibly 24/7. How does the invisible dog fence work? An invisible dog fence consists of a transmitter box, a boundary wire and a computer collar which is worn by the pet. The invisible dog fence transmitter box is installed in the customer’s house, garage or outbuilding. It is plugged into a standard socket. The boundary wire is connected to the transmitter box. It is installed around the boundary of the customer’s property. This is usually buried underground but it can be placed above ground. The invisible dog fence wire carries the harmless low-level radio signal around the wire. The wire has to start and finish at the transmitter box – i.e forms a continuous circuit. The pet wears a computer collar that emits a warning beep followed by a mild stimulation (similar to a carpet shock) when he gets too close to the designated area. The no go area for the invisible dog fence is marked with some temporary training flags to assist the pet with a visual. The Invisible dog fence Installer trains the pet to understand the avoidance area. Once the pet is trained the dog can be left in the garden without supervision and he will stay safe at home. The invisible dog fence gives the pet safety and freedom 24/7. 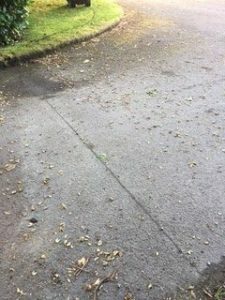 How will the dog fence wire cross my driveway? Will you have to dig up my drive to install the dog fence? No, we won’t destroy your drive when we install the dog fence. It’s a very neat and simple job and for some driveways completely invisible. It will also be 100% safe to drive over even with heavy vehicles. Most customers are concerned about how the underground dog fence wire will cross their drive or path. In most cases it is very simple to cross the driveway. The underground dog fence does not need to be buried very deeply in these areas. Will you have to dig up my drive. No, not at all – our expert Installer will make a small incision in the driveway with a disc cutter, place the cable in the gap and reseal it with silicone after. The scar will quickly fade and in no time at all you will not be able to see the incision. The cable will be safely protected. At all installations we will advise the best positioning for the cable and endeavour to make it as ‘invisible’ as possible. With our dog fence trencher we can install directly into a Gravel drive depending on the sub-base. If you want to place the cable in a conduit scrape back the gravel and then dig a small trench approx. 3 – 5” into the ground. Lay the tubing into the trench and pull the dog fence wire through. Make sure that the conduit is slightly longer than the driveway. Scrape the gravel back over the trench. Our DogFence Installer will not lift the block pavers. To cross a block paved drive we will look for an expansion joint and cross and seal here. If an expansion joint is not available, we will have to cut in between in each block and weave the cable across the boundary. All cuts will be sealed. Due to the construction of resin bonded drives it is not possible to cut this material without causing damage. Where possible it is best to use an underground ducts to pull the underground dog fence wire through and other options are available but this will need to be discussed with the DogFence Installer. It’s actually a really simple. The DogFence installer will have trained your dog or cat to stay within the dog fence boundary. This is a reverse training protocol and usually takes the dog approx 7 – 10 days to feel fully comfortable with leaving the property. Never all your dog to cross the boundary unless he has a contact with you. This could be with the lead or by carrying him or simply having a hand on his shoulder. And of course the best way to see how it works is to watch the lovely Lionel demonstrating how it’s done! At what age can a dog use an invisible fence? At DogFence we recommend that your puppy is a minimum of 12 weeks to start training to an Invisible Fence and where possible 16 weeks is ideal. Whilst we appreciate that some brands advise from 8 weeks old at DogFence we feel this is too young. It is important that your puppy has the maturity to understand that training for the invisible fence. If you are keen to get your puppy started quickly then follow these simple steps and this will assist with his ability to learn how to use the invisible fence. Make sure he is happy to walk on a lead. The majority of the Invisible fence training is carried out on a lead. Make sure is accepting some basic verbal commands, nothing fancy but a sit and come will help. Try to get him to interact with strangers – the more confident your puppy is the easier it will be for him to learn. Do not place the training flags – our Installer will do this on the day of his visit. Give us a call approx. month before so that we can schedule in a time and date to visit you. Will the dog fence work for more than one pet? Yes. There is no limit to the number of dogs or cats that can use our hidden pet fencing can protect at one time. Each pet will need his or her own receiver collar, and new animals must be trained. It is important to remember that any new cats or dogs added to the system will need training. Each time a new pet is added to the system the training flags must be placed around the boundary to give the pet a good visual. Can I take my dog fence with me if I move? Absolutely, Once you purchase the Dog Fence System, you may expand it or take it with you when you move. In nearly all cases you will need to renew the wire but the transmitter and the receiver collar will travel with you. Your pet will require re-training to the new boundary. Whenever you move property or change the route of the boundary the new area should be visually marked with training flags.Pets that are already trained to the dog fence need very little re-training. If you move house just let us know the new address and if necessary we can arrange a re-train. The great thing is the warranty travels with you (even overseas) so your initial investment is still safe. How big an area will the dog fence cover? At DogFence we offer electronic dog fences for all sizes of properties; from tiny town garden up to 350 acres. We can even install the fence through water and wooded areas. You can contain your dog in or out of almost anywhere, including interior features of your home such as sofas, dining rooms, and work-tops. Will an invisible dog fence work with any pet? An invisible dog fence will work with cats and dogs of all breeds and sizes. Interestingly here at DogFence we have also contained pigs, cattle, sheep, a fox and even a Shetland Pony using our invisible dog fence! Ideall your pet should be over 3 months old to be trained to the invisible dog fence. The reason for this is that the pet has to have the maturity to understand the training. We often recommend that cat owners wait until their kitten is 4 months + as cat training varies slightly and involves more Independence from the kitten. The invisible dog fence is not intended for use with animals that have a history of aggressive behaviour. Will the dog fence work for my pet? Yes, our dog fence has a great proven track record. There are some huge differences between our Professional dog fences and those that are found as a purely online purchase. Firstly our fence is quicker than your dog or cat! Our fences are actually 15 times quicker than the next brand. The key to the success is the use of a good quality system and proper training. All dogs and cats should be trained with flags. With proper training and correct use of the system your pet should stay home. We pride ourselves on our 99.5% success rate on our installed dog fence systems and furthermore we offer a containment promise (provided we install a full loop) for added peace of mind. (Conditions apply: collar must be correctly fitted at all times and the receiver battery must be an authorised operational battery). Why not check out our customer testimonials or google reviews! In order to learn the dog fence boundary your pet needs training. Your pet is trained by one of our highly trained Installers. The pet learns the containment area through voice commands, audible warning signals from the collar and training flags that are placed around the boundary. After the initial dog fence training you will carry on with some simple reinforcing training. Your dog goes through a training session with you for a few minutes each day for 3 – 5 days post installation. The training enable the dog to remembers the placement of the flags and is taught to stay within the containment area. During the training period, flags are slowly taken away. If your dog goes towards the boundary he will hear a warning beep indicating he’s too close to the containment fence. If the dog reaches the boundary, he will receive a mild correction. Our trainer will have taught your dog to recognize the warning beep and correction and he will quickly learn to retreat back into the safe zone. Will the dog fence hurt my dog? Will the dog fence hurt my dog a concern for many owners. The simple answer is NO, the dog fence will not hurt your dog. Containment fences are completely safe to use on the both cats and dogs. Containment fences have been tested and approved by the Government and leading Universities. Surely the “shock” will hurt my dog. Firstly, the word “shock” is misleading – the experts agree that the sensation should be described as an impulse. The impulse is very low, similar to an exercise belt. As a comparison dog fence collar outputs an average of 0.5 millijoules and standard electric fence used for horses and cattle averages about 250 millijoules. This type of stimulation has been used in dog training for over 40 years. And the amount of impulse can be adjusted so that a dog receives the appropriate level of stimulation for its size and temperament. Each collar can be set at different levels to ensure the best achievement for each pet. Naturally your pet will have to encounter an impulse in the early stages of training. However, after the appropriate training period the pet will listen for the audible warning and afterwards never penetrate the avoidance zone. DogFence products are used and recommended by vets and other pet professionals. You could cause harm to your dog if you do not remove the dog fence collar. Most receivers use metal prongs to deliver the impulse, and the friction and pressure can potentially irritate your dog’s skin after prolonged wear. By removing the collar every night and putting it back on the morning this will ensure that your dog is safe and comfortable. It has been proved that a dog’s skin is actually 25 times more resistant than a human’s. Many customers like to test their dog’s collar on themselves. Of course, we’ve all tried it here at DogFence and it is definitely not painful. How long does an invisible dog fence installation take? Depending on the size of the property, installation and training is usually done within 1 day. Occasionally on larger properties the installation may take 2 days but no more than that. A normal day starts with the engineer arriving on site at 7:30am; he will then discuss the layout of the cable and walk the boundary with you to make sure you are happy with everything. Once the route and been defined the Installer will install the cable and get the system up and running. This is usually completed by lunchtime unless it is not possible to trench the able. Once the system is installed the Installer will commence the dog fence training. The Installer will usually train the dogs individually and part of the training will involve the owner. Once the dog are trained the Installer will run through any trouble shooting, operational features and monthly checks so that the owner understands that system. The dog training notes are returned to the office and logged. The office staff are always on hand to answer any questions post installation and our Installation Team will contact the owner if necessary. Full support is offered for the lifetime of the dog fence system.